After last week's fiery episode, Nick has apparently found some free time and is in the trailer trying to figure out what The Key is hiding. Frustrated, he heads home where he interrupts Monroe and Rosalee having a private moment. Of course, Monroe forgives him for the intrusion. And he's wearing his adorable bow-tie again! After Rosalee heads home, Nick shows Monroe The Key and the map it creates. As usual, Monroe knows everything. He immediately recognizes the geography from an old map his great-great-great grandfather left to him. He pulls out an ancient map of an area of Bavaria by the Black Forest. Well, well, now it's time to find where the other six Keys are so we can find out what these ancient Grimms hid away. In the dark of night, a rancher in an ATV finds a dead cow with it's belly ripped open. A little further away, a second mutilated corpse lays on the ground. Suddenly a blue glowing alien guy jumps up and rushes at the man. Poor John is forcibly impaled on a fence post hanging from his ATV. Glow Man rushes off with his bag of cow innards to a barn where a very pregnant woman immediately starts scarfing it down. The good news is that the baby is doing fine! As morning comes, Glow Man has put his human face back on and heads into town to steal a car so the pair can move on. He has an interesting technique. He stands in the road all glowing and waits for a truck to drive by and run into the ditch. While our alien friend gets a new ride, Nick goes looking for a Key consultation. So, who might he go to for more information about The Keys? Why Capt. Renard, of course! He tells Nick a bunch of legends about what the Royal Families have thought that The Keys might hide. This conversation is interrupted by Sgt. Wu who's come to tell them about the cattle mutilations and possible alien sighting. “The truth is out there, east of Portland,” he deadpans as he leaves the room. Wu and Nick head off to investigate and do indeed find shreds of blue skin on a barbed-wire fence. A ufologist arrives on the scene as well. Wu blows him off with a threat to probe him. This doesn't deter the alien chaser. He latches on to the old rancher who identifies the alien as one from a news clipping from Tulsa. So, it turns out the skin Nick found at the crime scene contains a bio-luminescent enzyme called luciferase. This cause the skin to glow when the “animal” is under stress. After a little more digging, Wu turns up that all of the mutilated cattle were missing their ovaries. Well, this is the last little bit that Nick needs to identify our glowing fugitives. They are Gluhenvolk, a reptilian species of Wesen that was thought to be extinct. The pregnant females eat cow ovaries to prevent premature delivery. Don't forget Juliette! She's busy trying to remember more memories of Nick. You know, the guy she told to get lost? She dwells on a photograph of the two of them that was taken right after they exchanged their very first 'I love yous.' To her amazement, she remembers everything! So, while Nick is off chasing aliens, Juliette pays a visit to a bespectacled Monroe. He honestly seems to be getting a little tired of these little visits. She shows him the photograph, and tells him that she remembers how much she loved Nick, but she's afraid he doesn't feel the same about her anymore. After this pointless conversation, she hits Monroe up to tell her what a Grimm is. Monroe hesitates and then solemnly pronounces that a Grimm is “someone who can see into the heart of darkness.” Yeah, this doesn't really explain anything for Miss Can't-Make-Up-Her-Mind. Turns out the crazy ufologist is really a Raub-Kondor trophy hunter. 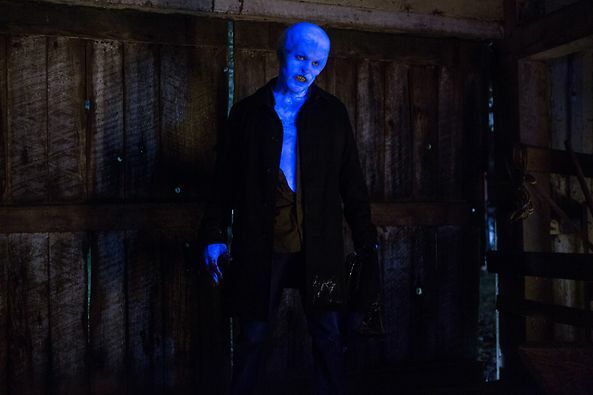 And right now he's on the hunt for our pair of glowing Wesen. Looks like someone out there wants some Gluhenvolk skin for a very expensive trinket. And he's tracked poor Vincent and Jocelyn down. Monroe and Rosalee meanwhile, are terribly excited at the thought of seeing a real live Gluhenvolk and join Nick in his search. After finding the Raub-Kondor's trailer and it's assorted deadly paraphernalia, they rush onwards and find Jocelyn, the pregnant Gluhenvolk, in labor. Rosalee immediately sets into baby delivery mode and they are shortly introduced to a tiny blue glowing baby girl. They don't have much time to celebrate though, because the hunter barges in and thinks her skin would look good on a wall somewhere. Everybody then goes full on Woged and Nick ends up shooting the idiot with his own gun. 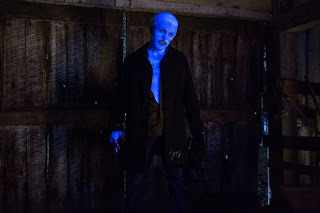 The special drugs he had loaded the bullets with made him stay in his Wesen form for several hours after death. This provides the perfect opportunity to blame the entire fiasco on him and leave his corpse to be found while the Gluhenvolk family go to Alaska to be with what's left of their kind. Aww, kind of makes me feel all warm and glowy. Nick has really progressed from his black and white view of the world hasn't he? The next episode of Grimm, "Kiss of the Muse," airs Tuesday May 7 at 9 p.m. ET on NBC.